A series of earthquakes which shook northern Japan, for more than two hours. The first quake measured 6.8 and was centred in Niigata state, 160 miles (260 kilometres) north of Tokyo. It is reported to have caused landslides and blackouts and cut water and telephone services. Some houses have reportedly been destroyed by the tremors, and a bullet train was derailed. The first quake struck at 1756 local time (0856 GMT). Intermittent aftershocks included a 5.9 quake which hit 16 minutes later. A high-speed bullet train on the Tokyo-Niigata line was reported to have jumped the tracks during the first quake, while it was travelling near the epicentre. Cracks in the roads have appeared near the epicentre with motorists reporting seeing the road "rise up in front of them", a BBC correspondent said. Two tunnels also collapsed along the Tokyo-Niigata highway. People in some parts of Niigata had difficulty standing during the quakes. The quake comes days after Japan was hit by its deadliest typhoon for a decade, which killed about 75 people. Japan has been hit by 10 typhoons so far this year. 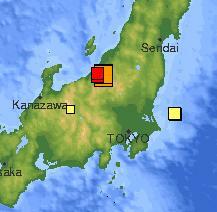 Media reports said the shaking in some parts of Niigata was so severe that people had difficulty standing. Buildings in Tokyo swayed several times for up to a minute. Sewage and water mains burst, gas and telephone services were down and about 250,000 homes lost power, officials told Japanese media. The jolt triggered an automatic safety device that temporarily halted train services, according to media reports. Railway officials said a bullet train carrying about 150 passengers derailed and some of the cars tipped to the side near Nagaoka city. Typhoon Tokage ripped through Japan this week with high waves and rapid mudslides, demolishing homes and flooding dozens of communities in western Japan before losing power and disappearing over the Pacific Ocean. Authorities said there were concerns that the shaking could cause topsoil loosened by the storm's torrential rains to slide down hillsides.